Hydropower in Snowdonia: a green blessing or a moneymaking blight? Snowdonia's wild rivers and streams are at the centre of a hydropower gold rush. But where is the money going – and is this green energy worth the cost to the Welsh landscape? Ray Wood investigates. The mountains of Wales are well known for being wet. And with Snowdonia’s maritime climate seeing an average rainfall of over 3,000mm per year, eyes have long been on this natural resource. Just over 50 years ago, the damming of one end of the Trweryn Valley near Bala, to create a reservoir serving Liverpool, sparked nationalist fervour and was a significant moment in modern Welsh history. Today, water is once again a source of controversy in Snowdonia National Park. This time, it’s about harnessing the energy of its rivers and streams in hydro-power schemes to produce green electricity. And as the numbers of hydro schemes rise, some conservationists and organisations concerned with protecting Snowdonia’s upland landscape have serious concerns about their potential long-term effect. "The growing concern is that commercial companies are exploiting the water of Wales and at the expense of the natural landscape and communities." 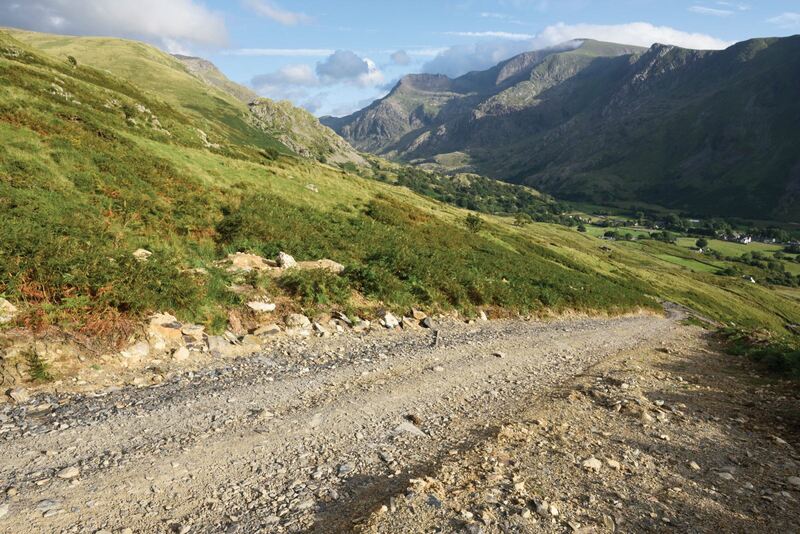 Anyone undertaking the Welsh 14-peaks recently would have noticed the fresh vehicular track that zig-zags across the hillside above Nant Peris to reach Cwm Dudodyn, below Elidir Fawr. Built to provide excavator access, this Special Area of Conservation now features a concrete weir and intake to divert water down a 1.8 kilometre pipe to a turbine house on the valley floor. And in May this year a stop order was placed on another hydro scheme by the Park planning authority, after a brown plume of soil and silt – related to mechanical digger excavation work at the nearby Afon Las site – was spotted at the inflow to Llyn Padarn. Of course, such issues aren’t always the case and some scars heal with time. 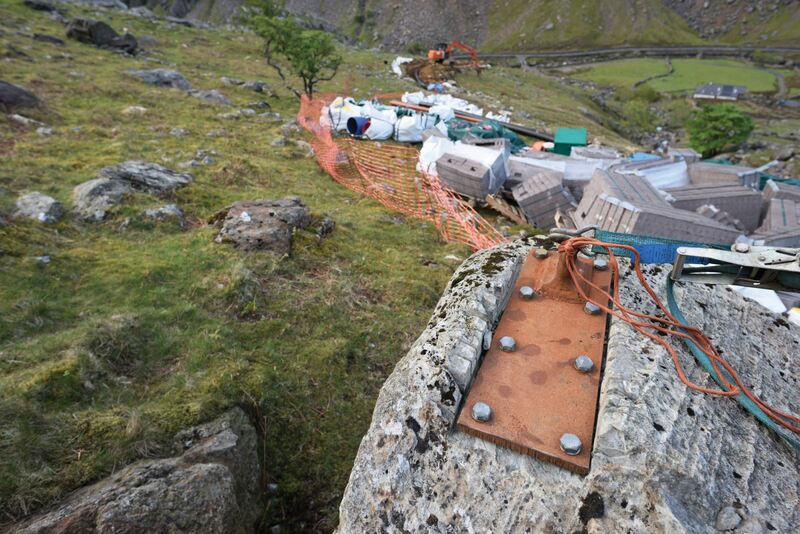 The National Trust’s first large-scale hydro scheme (614 kW), that began operation in 2014 in Cwm Llan near Snowdon’s Watkin Path, now shows few signs of the ground works and construction that went into building it. The intake is situated among the old copper mine workings – where once a water wheel would have turned – and it’s now hard to notice where the mile of buried pipe runs, carrying the water that produces enough power for 445 homes. The electricity produced by the Trust hydro scheme is sold to their energy partner and green electricity supplier: Good Energy. But how many small-scale schemes can one national park handle? In the last three years, there have been over a 100 hydro-related planning applications in Snowdonia, resulting in 104 hydroelectric schemes with a Natural Resources Wales “abstraction licence” operating in the National Park by the end of 2015. Why have we seen this huge increase in the development of hydroelectric projects in the Park? In a word: feed-in tariffs. Feed-in tariffs (or FITs) were introduced in 2010 by the government to help increase the level of renewable energy in the UK. The FIT has three benefits: a generation tariff paid on the total output of the renewable energy system (whether you feed it into the grid or use it yourself), an export tariff paid to you for electricity exported to the grid and a saving on any electricity you need to buy to make up a shortfall. If you think this sounds like a good deal, you’re not alone. These tariffs make hydroelectric schemes attractive to commercial companies, who typically cover the initial capital costs and come to an arrangement with the land owner. Once started at a given tariff they last 20 years and are retail priced indexed. But the growing concern is that commercial companies are exploiting the water of Wales and building small-scale hydro schemes for profit at the expense of the natural landscape and communities. “It’s not the short term scars on the countryside that are of importance, the grass will grow back again, after all, it did when a glacier came down the Llanberis Pass. 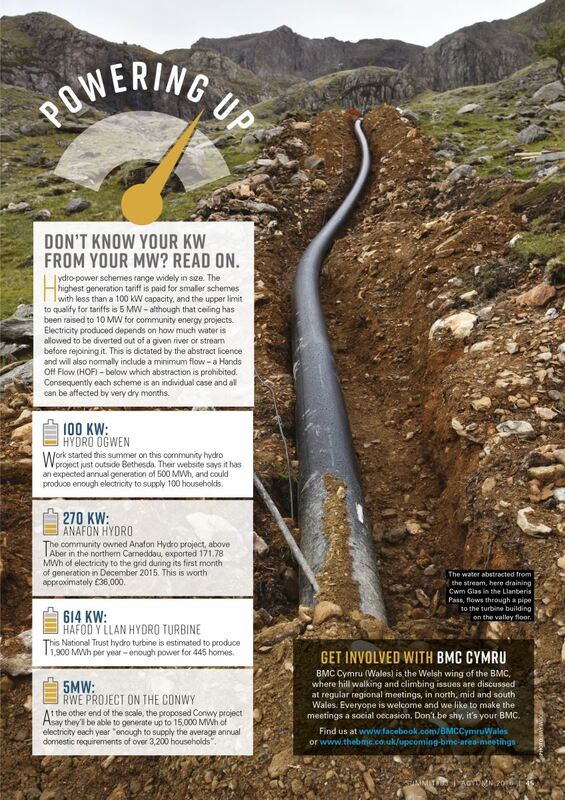 The longer-term question to ask is who is making money from it?” commented Al Hughes, chairman of the Llanberis community micro (55 kW) hydro scheme. Al strongly believes in community ownership of water and that any scheme should have a direct and lasting benefit to the people that live in that catchment, rather than a multinational company, and that any profits should stay in Wales. Enforcing compliance with a scheme’s abstraction licence is another difficult issue. Licenses are written to protect the environment and flow in the watercourse. From January to August 2015, of the 104 hydro power sites in Snowdonia for which Natural Resources Wales is responsible for licensing, it inspected 33. Seven were found to be in breach of their abstraction or impoundment licence; five of those seven were found to be breaching the terms of their licenses deliberately by altering the mechanics of the structures used to take the water. Enforcement responses can include prosecution, formal caution, monetary penalty, warning letter or advice and guidance. Yet, in Wales, it’s not just streams that are under threat, but rivers too. 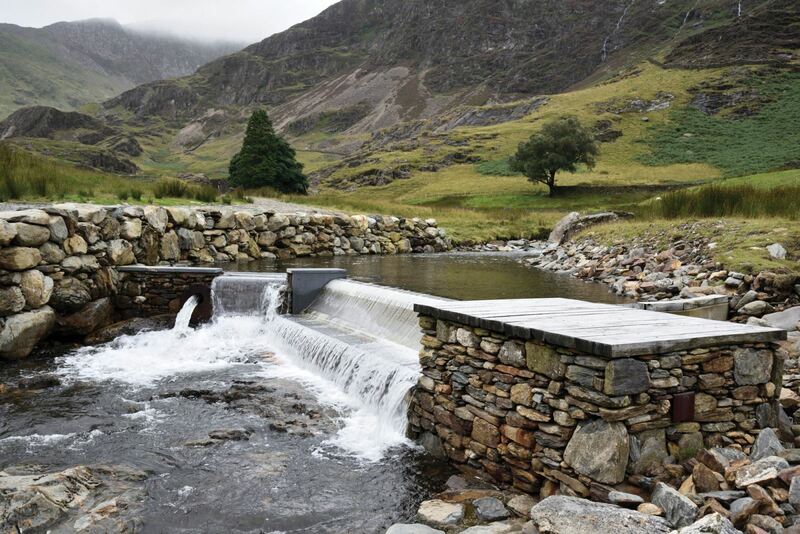 A Snowdonia hydropower planning application that has attracted a great deal of concern is the £12 million Afon Conwy scheme put forward by RWE npower, part of the German multinational utility company RWE. "Like a bag-for-life, renewable energy can be a convenient salve for the conscience. But all energy comes at a cost, which shouldn’t be swept under a green carpet." In February this year, a petition with over 6,000 signatures was delivered to the then Minister for Natural Resources, Carl Sargeant, objecting to the industrialisation of the Conwy. At the Snowdonia Park planning committee the following month, planning was turned down and RWE was asked to provide further information. In response, RWE say the Conwy hydropower scheme has the potential to supply the average annual domestic requirements of over 3,200 households. However, to put this in perspective one average offshore wind turbine of 3.6 MW can power more than 3,312 average EU households. The planning application has now been resubmitted to Snowdonia National Park Authority and Natural Resources Wales continue to delay their decision on giving an abstraction licence. For Dan and the Save the Conwy campaign, the clock is ticking again and their awareness-raising work continues. The challenge is in how we strike the right balance, and micro schemes benefitting local communities are very different to large multinational developments. Are these hydro development schemes simply exploitation of our rivers and streams to farm the generous subsidies, or are they an important component of reducing our carbon emissions? Time will tell. Ray Wood made his career as a photojournalist and is now also involved in filmmaking. Based in North Wales, he sits on the BMC’s Access Management Group and the Northern Snowdonia National Park Local Access Forum. Since this piece was written, RWE have withdrawn their second planning application for large scale hydropower development on the Conwy, shortly before it was due to go before the Snowdonia National Park’s Planning and Access Committee on 12th October. 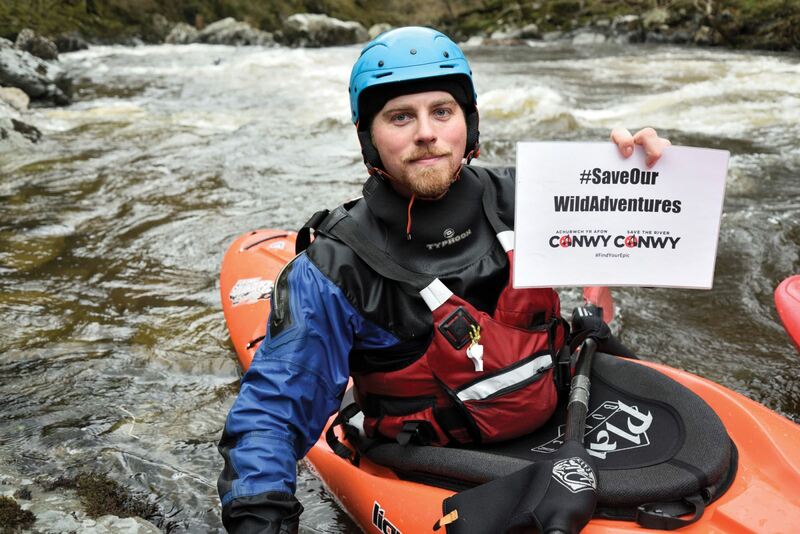 Read more on this by the Snowdonia Society and the Save the River Conwy campaign. Following on from the article in Summit, written by Ray Wood, highlighting the issues surrounding the number of Hydro-Electric schemes being built in Snowdonia, there have been a number of significant developments surrounding these proposals. A good article and, in my view, any correctly designed, installed and operated hydropower scheme is a green blessing. Any deliberate abuse of licence conditions should be severely penalised. Having previously worked in the industry I know that developers have to spend considerable sums or money at risk before a scheme is fully designed and licensed. This is due to the onerous and precautionary requirements that the Environment Agency and Planning Authorities put in place. Developers are often unlikely to make a profit during the first 8- 10 years of operation. In my view, community schemes might be regarded more favourably to developer led schemes. Hydropower is one of the most dependable forms of renewable energy and the disturbance of construction work soon disappears. 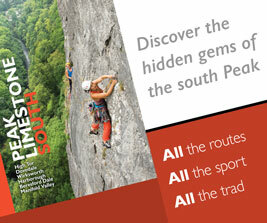 Our National Parks contain numerous examples of industrial heritage and are richer and more interesting for it. I believe that hydropower schemes sit well within this historical context. I would love for all our wild spaces to be untouched by human intervention. However, with CO2 levels now consistently exceeding 400ppm we can no longer afford to be too fussy. Whether a hydropower scheme or a wind turbine, we need every kWh of clean energy that we can harvest. The concerns of those who care for wild spaces are an important part of the discussion to ensure that the best possible schemes are delivered. But without some small compromises we risk blocking schemes, which is likely to be more environmentally detrimental in the long-term. Hydro electric schemes less of a scar on the landscape than scores of cars parked on side of road from walkers unwilling to pay parking fee.